Art lesson featured artist is George Seurat. The students discovered the style of pointillism through the work of French artist, Georges Seurat. They created their own “pointillism” masterpieces while learning and applying color theory. Thank you Keira Merkovsky for organizing classroom lessons and to all the PTA volunteers who helped in the classroom lessons. 2018 Jog-A-Thon Shirt, Socks and Sweatshirts where distributed March 16th. Extra inventory was sold on Monday, March 19th. We still have a limited number of T-Shirts and Sweatshirts that will be sold the day of Jog-A-Thon. We also have a few 2017 Jog-A-Thon Shirts as well as Gates PTA T-shirts that will also be sold. Our new Gator Socks are SOLD OUT! 2018 Jog-A-Thon Shirt is now available to order online. Thank you Michelle Mendoza, Spirit Wear Chair for all your hard work! Thank you Carrie Yannarella, Teacher Appreciation Chair and all our parent volunteers helping with Teacher Appreciation Breakfast, Luncheons and snacks during the week week! Thank you to all the parent volunteers who helped make poster and helped during the week. Gates PTA officers for the 2018-2019 school year were elected at the March 20th Gates PTA General Meeting. Congratulations to our new Executive Board! Our next PTA General Meeting is May 22nd at 7pm in MPR. Come celebrate the end of another great year! Save the Date! Join us this Thursday, March 22 for Family Dine Out at Fuddruckers from 5-9:30pm!! Our beautiful school will get 20% back!! Tell all your friends and family! See you there!! Next dine out tentatively schedule in April. Stay tuned. This year we have 157 Gators participating. The children are doing a fantastic job getting fit and taking on the weekly nutrition challenges. Turned in nutrition challenges are entered into a drawing for snack prizes. Youth Coaches - Cameron S., Alina S., Maria G.
Mandatory KROC Parent Meeting: May 3 from 7-8pm in the MPR. - Friday is still Spirit Day so wear your Gator GREEN! - Please continue to collect donation until April 13th date! Volunteer signup was sent out on Konstella. It’s not too late to register! More acts wanted! Alumni students encouraged to volunteer at this event to receive Community Service Hours. Contact familyevents.gatespta@gmail.com for volunteer opportunities. Thank you everyone who came out for this family event. Thank you Bobbie Cuningham and Olivia Renella for Chairing this event and supporting the arts at Gates! This year Gates PTA was able to give the gift of books to every Gates student. During class visits to the book fair each student was given $5 scholastic dollars voucher towards a books. Thank you Brenda Thompson for chairing this wonderful Program for our children. Everyone loves the Book Fair!! Camp Out Committee: Last year Gates PTA started a new tradition for our students - The Great Gates Family Campout! We want to continue this event but first we need Volunteers to join the Committee! We are looking for volunteers who have special camping skills or just want to help. Do you have contacts with Scouts who can help explain how to build a tent? Do you know how to make cool camp crafts? Can you play campfire songs on a guitar? Or are you a grilling machine who can flip pancakes or burgers? This event will take a lot of help but will create lasting memories for you and your family. If you are willing to help, please contact Mark & Stefanie Nix at familyevents.gatespta@gmail.com. There will be plenty to do but many tasks can be completed while you participate in the event with your family. Those who volunteer to help will get priority in registering for the event. Gates PTA began using this communication tool. 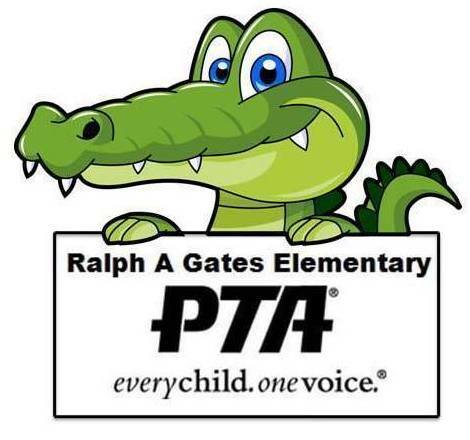 It is intended to keep Gator families and staff up to date on PTA events. Paper flyers will continue to be sent home but many times they stay buried in our children’s backpacks. Please help spread the word to other parents.